Reclaimed weather planks used in this ceiling and playroom in Canmore - colours inspired by the clients' love for Mexico. This shelving is made from 2 x 8 Douglas fir salvaged from a barn in Milk River, Alberta. Top suface sanded and clear coated to a natural smooth finish. Palm sanded and distressed on 3 sides with white paint. This armoire was built for some clients in Calgary from reclaimed Douglas Fir material salvaged from a barn in the Pincher Creek area. A perfect blend with modern furnishings and a clean colour palette. This beauty of a barn had to come down late in the Summer of 2016. We feel honoured to have been part of this reclamation and commend the landowners for all the care and attention they put into assuring that the wood was re-purposed. .
From our recent Milk River Project - some gorgeous 1" x 12" Douglas Fir Planking. With this picture we'd like to pay tribute to a building that has provided excellent shelter over the decades. The landowner has done all he can to maintain the building but for safety reason she must now come down. We will salvage all that we can and give the material new life, for a new owner. These doors were custom built for a client in the Edmonton area who was looking for a little more zip for their basement renovation. 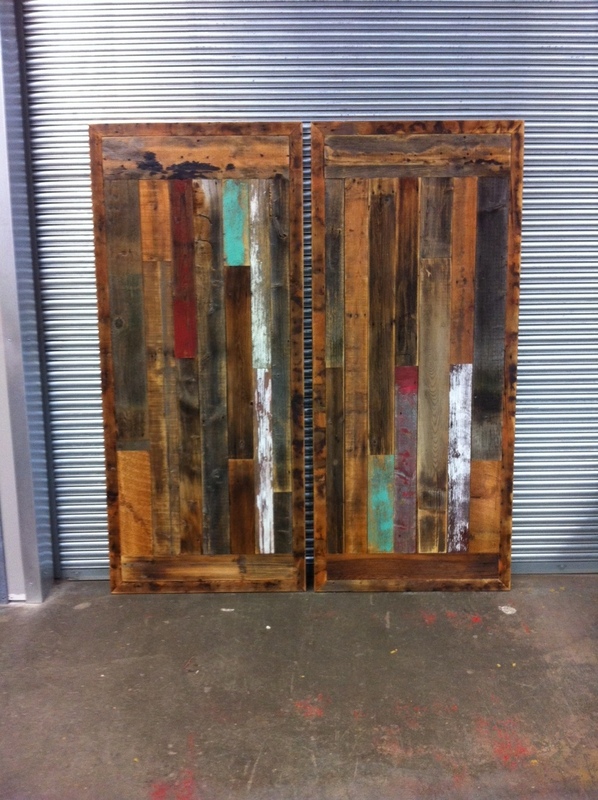 We used an assortment of reclaimed Douglas Fir barnwood for these double sided solid doors. This month we were able to rescue material from this dear old building. At one time it was a Canadian Pacific Railway coal shed, but was later used as a dairy barn. Time and wind has taken its toll and the landowner had to make some hard decisions about the building. It was slated to be pushed into the burn pile, but in partnership with the landowner, we were able to recover most of the wood and hardware from the building. We are currently moving into a new space in Pincher Creek and soon we will be able to share details on our new set up. In the meantime we are busy trying to unload some material from one of our warehouses. This will save our crews a lot of backbreaking work. In the coming week we will be taking appointments to wholesale material Saturday March 19th - Tuesday March 22nd ..... then we will be taking a break over Easter and re-organizing our new shop and warehouse.